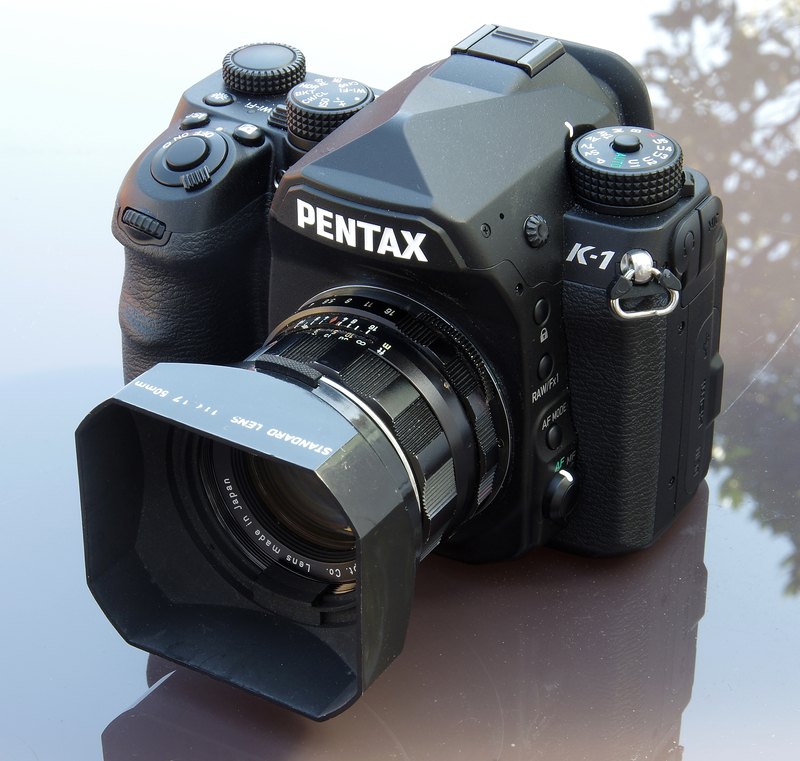 Introduced along with the then-new Pentax Spotmatic, this lens has a small caveat attached to its use on early film cameras. It can only be used on pre-Spotmatic S1a/H1a and SV/H3v film bodies that have the new crescent shaped push plate to activate the stop down pin. The appropriate cameras will usually have a 7-digit serial number and an orange R on the rewind crank. This is because the rear element protrudes and can foul the mechanism of earlier film bodies. Having baffled us DSLR users though, we need have no such fears as our cameras have moved on somewhat. The screw thread lens mount is devoid of electronic contacts and an adapter is needed to fit the lens to our selected DSLR camera body. Screw thread lenses can be fitted via an adapter to almost any camera, but here we have the Pentax K-1 and the ideal is the Pentax manufactured Adapter K. This fits inside the camera bayonet mount. The technique is to fit the adapter to the lens and then bayonet onto the camera. The lens can then be unscrewed and another fitted if desired, effectively temporarily converting a K mount camera body into a screw thread one. The adapter is removed by operating a small lever on the adapter and letting it fall out into the palm of a hand. Having mounted the lens, our brief tour starts at the large front element and the 49mm filter thread. 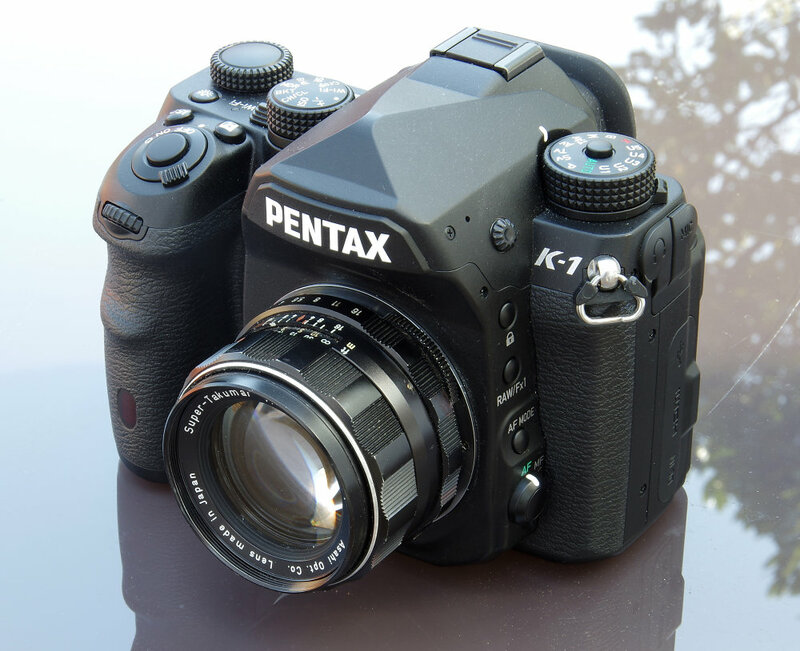 Whereas the push on metal lens cap can be partially pushed off when some of the smaller aperture lenses are used, the f/1.4 version has no such problem. The focusing ring is sculpted for grip, and the sheer pleasure of operating the focusing mechanism brings new meaning to the phrase silky smooth. This particular sample has not worn totally evenly, having a stiffer section in its travel, but the point holds good for most of these lenses. Distance markings in feet and metres are viewed in a cutout on the lens barrel, and there is a useful depth of field scale. There is also an infra-red focusing mark to show the revised distances necessary when using IR film. 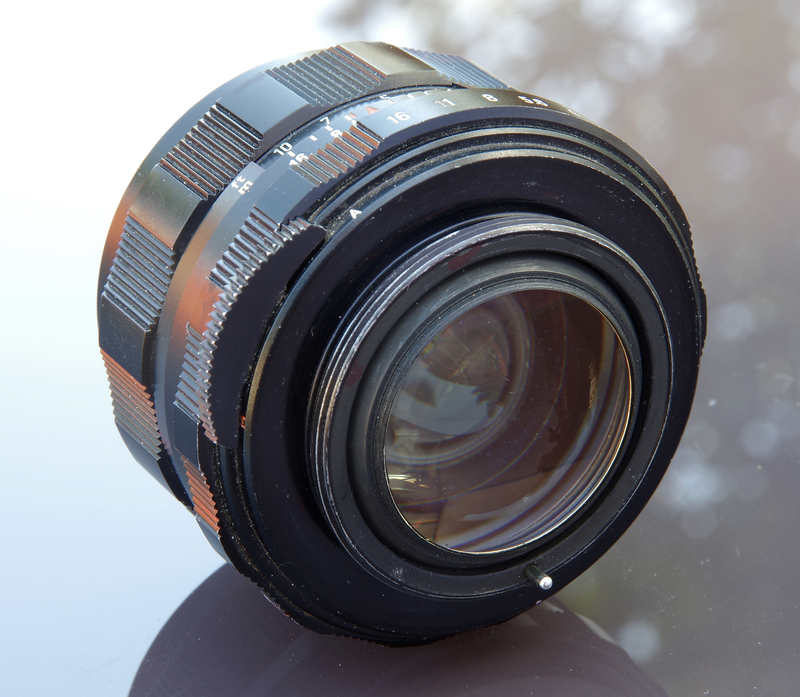 The aperture ring has half stop indents and is smooth in operation, running from f/2 to f/11. The stop to the widest, f/1.4, and smallest, f/16, apertures is a full stop, with no half stop indent. Behind this is the Auto/Manual switch which selects between open aperture and closed down aperture. This is very useful for DSLR metering as set to Auto the diaphragm opens to maximum aperture and focusing is easier. The beep of the K-1 focus confirmation is an added guide to getting the focus spot on. For this to work the camera should be set to AF. When we are ready to shoot the image moving the lever to Manual will stop the lens down to whatever value we have selected. The alternative technique is to leave the switch on Manual and just use the aperture ring to open the lens up, then count down the steps to set whatever working aperture is desired. It should be noted that some A/M levers will only work when the lens is mounted on the camera, so one that is solidly fixed may not indicate a fault. In this case the lens is early enough to have no additional levers on the mount, so use is perfectly straightforward. The optical construction is 8 elements in 7 groups. Focusing is down to a conventional 0.45m or 1.5 feet and the lens weighs in at 245g. In the context of 1964, handling of the Super-Takumar lenses is sublime. They focus closer than many, have super-smooth controls, are compact and have an elegance of design that makes many contemporaries look very clunky in comparison. In the context of 2018 and a DSLR, manual focus is what it is and will suit some and not others, but otherwise the lens is still quite beautiful to use. There is a certain pleasure to be experienced in such elegance of engineering, design and fine quality of manufacture.